The biggest festival of Norman language and culture came back to Jersey in 2005 - traditional dancing, singing, stalls, food and drink. Performers from Jersey, Guernsey and mainland Normandy. Fun for all the family! 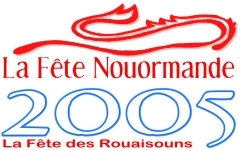 In 2005 the Fête Nouormande went to Trinity for the Bank Holiday weekend, 28th-30th May 2005. In partnership with the RJA&HS, there were three days of traditional culture from Jersey, Guernsey and mainland Normandy - not to be missed! Even the cows were mooing in Jèrriais, after a week of Jèrriais-flavoured street entertainment in St. Helier culminating in the by-now traditional parade in costume of participants on the Friday evening. The week-long Fête kicked off at La Société Jersiaise (5.30pm) in St. Helier with the sell-out launch of the Dictionnaithe Jèrriais-Angliais - Jèrriais-English Dictionary. In and around St. Helier, there was promotion of the language in markets and shops. Street entertainment (music, singing, poetry, bachîn ringing) with special appearances by the group La Sagesse Nouormande playing hurdy-gurdies and other traditional instruments. Exhibition/display at the Maîson de Normandie. Learn how to get strange music from the traditional preserving pan! Formerly a custom to drive away evil spirits, bachîn ringing is now a folklore tradition that over the past few years has become a regular event at the Fête Nouormande and other Jersey events. Bring your own bachîn, if you have one as a family heirloom, or just come along and try one of ours. All welcome, young and old. Entry free. Dancing and music in the pedestrian streets of Town ... come along to Wests Centre at 2.30pm and 5pm to find out more about traditional dances. Three days of Fête Nouormande in Trinity. There was a church service in Jèrriais on the Sunday morning (starting at 12 noon) before the start of the programme at the RJA&HS. Traders from mainland Normandy set up stall to sell their delicious wares, including Calvados and other products of the apple orchard, cheeses and traditional bread. Bouôn appétit! The book stall offered a range of publications in and about the languages of Jersey, Guernsey and mainland Normandy: books, booklets, dictionaries (including the freshly-launched Jèrriais-English Dictionary), cassettes, CDs, CD-ROMs and gift items. Materials relating to the languages of Jersey, Guernsey and mainland Normandy were on display. A guided walk around the surrounding lanes of Trinity took plae on Sunday morning starting at 11am. The by-now traditional prom'nade ès cats (catwalk) - Saturday, Sunday and Monday at 2pm - offered a chance for an explanation of the significance of the different regional costumes. As usual, a booklet contained the texts of songs, stories and poems to be performed during the week-long Fête and was on sale from festival venues, so even those whose Jèrriais, Dgèrnésiais or Norman may be a little rusty (or non-existent) had the chance to follow the words as the performances unfold.